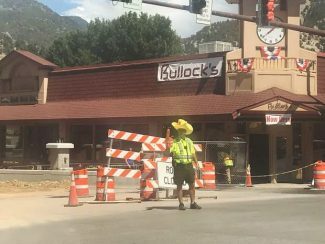 Glenwood Springs Police Chief Terry Wilson directs traffic with a foam finger, while wearing a foam cowboy hat, Friday afternoon. Two weeks into the Grand Avenue bridge detour, Glenwood Springs police say they will be moving from the warning phase to writing more tickets for infractions ranging from speeding and running stop signs to misuse of the dedicated bus/emergency lane on northbound Grand. “For the most part, I’d say I would have to give the majority of drivers an A-plus out there,” Police Chief Terry Wilson said Friday while returning to his traffic-control post along the bridge detour route at Eighth and Grand. That said, though, a few bad apples are disobeying some of the rules, both official and unofficial, both behind the wheel of a vehicle and on bikes, Wilson said. What started out as a warning period for people violating the more formal rules has taken a turn toward ticketing, he said. Most of those tickets have been for misuse of the right lane of northbound Grand/Glen avenues, and on Colorado 82 coming into town from the south. That lane is reserved for emergency vehicles, buses, permitted vanpools and right turns only. Motorists who are making a right turn are to stay in the left through lane until a half block before their turn. Likewise, those making a right turn onto the detour from a side street or business access are to merge into the through lane within the next block, Wilson clarified. Anyone caught cruising the right lane for too long will get a ticket, he said. That goes for bikes using the right lane. Bikes are to adhere to the same rules as vehicles when using city streets and state highways, Wilson said. Tickets are also being issued to motorists making left turns onto and off the detour route where prohibited, and for typical traffic infractions such as speeding and running stop signs, which he said seems to be heightened now with the detour in place. On the informal front, “We still have people trying to do the go-around on Blake and over on Midland to try to cut the detour,” Wilson said. Blake in particular has been a problem during the late afternoon/evening rush when commuters are mixing with legitimate neighborhood traffic and trying to get back on the detour as far north as possible. Especially if they try to pass through at Eighth Street, “that just complicates everything and slows things down,” he said. The light at Eighth and other intersections is timed to heavily favor the detour traffic. But Eighth in particular is also a critical bus route for the free in-town RFTA shuttle that runs between the Amtrak Station and the 27th Street bus station. “When people try to come in on Eighth, they are clogging that arterial that we are trying to maintain for the buses. And, frankly, the bus routes are critically important right now,” Wilson said. Motorists who legitimately do need to get onto Grand from the east side of town are advised to do so as far south as possible at a signalized intersection, such as 10th, 11th or 14th streets, he said. The detour cheaters are also getting inventive, such as one motorist who went into the middle turn lane between 27th and 23rd streets, and tried to merge right back into the through lane. “We got the sense from the other motorists that this person was no more needing to get someplace than they were,” Wilson said. Bicyclists are not immune from being ticketed, either, including one bike commuter who blew through three stop signs in a row on Blake without even slowing down, despite a patrolman beeping his horn and tapping the siren from behind. Wilson said he typically has seven to eight patrol officers dedicated to traffic control during the afternoon rush, plus two officers out on e-bikes and four additional officers available to deal with other types of incidents. Meanwhile, work is proceeding on schedule to dismantle the old Grand Avenue bridge, including removal of the bridge piers in the middle of the Colorado River and alongside I-70. The pier structures are gone, but some concrete still needs to be removed from the base, project spokesman Tom Newland said. Project officials on Friday were able to reopen the Colorado River to private and commercial river users. The Shoshone and Grizzly Creek rest areas are now open as well, but future river closures may be necessary at work continues to build the new bridge.